I started my barefoot journey when I took on a 16.3h TBxID who had been diagnosed with navicular at 4 yrs old! I offered him a home as an alternative to his other option of euthanasia. I tried various routes with him, not believing he could possibly go without shoes, but was not able to keep him comfortable. His feet looked dreadful (when I look at old photo's - at the time they looked normal) and his movement was more like that of a 12.2h pony! Interestingly, he would pull his front shoes off on the fence, and when this became a weekly habit I resigned myself to pulling all shoes and giving him some time off, still not believing it was possible to ride without shoes. (Should have been listening to him more carefully - took me a while to hear what he was asking me to do!) He barely moved for three days in the paddock (he was living out by then) but then gradually things started changing. I started leading him up the lane for ten minutes a day, and then increased the time until he was as comfortable on the road as he was in the field. I had an excellent trimmer, and educated myself to trim too. I had also met Lucinda McAlpine, who had shown me that part of barefoot success is re-educating the horses locomotion when ridden. After six months, I was riding every other day on miles of roads on a very sound and free moving horse. Ten years later I have four barefoot horses, my 'navicular' horse is now 18yrs old and going as well as ever. One is an ex polo pony I took on, who was the easiest to transition, having spent six months of every year barefoot when the polo season was over. One is a rehabilitation case I took on, a quarter horse mare with similar confirmation problems to another story I have read on this site. Her feet are very small too, but I have found that with her it has been most important to address the way she carries herself when ridden, this makes all the difference to sensitive or not. She definitely needs to be not on the forehand. I have also been using the Performance barefoot, forage plus mineral supplements. Extra magnesium made a huge difference to our boy who was rather flat footed and likely insulin resistant, he grew in a much straighter foot and gained significant concavity. It's well worth looking at their website. 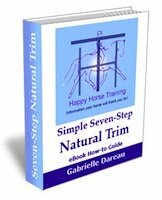 I trim all of my horses now, although this is minimal because we do plenty of roadwork. I do have hoof boots for the quarter horse, but don't use them any more as they are all just as sound without. My horses live out 24/7, using a track system from April to October, making haylage off the centre, and then free ranging in a large and interesting field over the winter as it gets too wet to use the tracks. We have a pea shingle area and a large barn they can choose to use or not. I also move them to a different field for a month twice a year to allow for harrowing, rolling and resting and to hopefully satisfy the horses migratory instincts somewhat. My husband and I took the horses over some very challenging, rocky terrain on Exmoor last week and they didn't miss a bit, in fact I wouldn't have ridden it with shoes on for risk of them slipping on the rocks. Thanks for sharing your story with us! It's a great example of how sticking with it leads to success - even with cases such as Navicular. It's so good that you have provided the lifestyle and diet that are such an important contribution towards healthy barefoot hooves. We also believe that the way horse's carry themselves is very influential to the function of their feet and limbs - it's another part of the holistic picture.